Behind the façade of polite, Liberal sounding, “morally concerned” rhetoric, the BDS Movement is a well-funded and coordinated campaign of Machiavellian character and malignant intent. This week, one of my goals is to pass on some information and insights gained through reading The BDS War Against Israel: The Orwellian Campaign to Destroy Israel Through the Boycott, Divestment and Sanctions Movement, by Jed Babbin with Herbert London. The BDS Movement is not about fairness and justice, but rather about delegitimizing the Jewish State and if possible strangling it to death. This elimination of the Jewish State could be accomplished by extinguising its character, cutting off its lie support, or uprooting it from its place. On the first point, consider the words of BDS Activist Omar Barghouti on the purpose of the movement – “The right of Palestinian refugees to return to the homes and lands from which they were displaced and dispossessed in 1948.” But there is no such right, but the UN has extended this right to all descendants of those claiming dispossession which would mean about 5 million people even if they have been living in Syria, Jordan, Egypt, China, or Norway in the intervening years! Add this to the 1.5 million Arab currently in Israel, and one no longer has a Jewish State. Simple. In his succinct examination of the BDS Movement, Jed Babbin reports that, “Overlooked in this narrative is the fact that the Jewish communities in Iraq, Syria, Iran, Egypt, and Yemen have all been forced out of existence creating Jewish refugees totaling more than 600,000. The injustices visited on these people are not recognized by the United Nations or even acknowledge by the world media.” I would add that such an injustice does not matter when it happens to Jews, and that the Jewish people managed to recover from such dislocations, building a new future, and without perpetuating their refugee status as a means of leveraging world opinion against those who dispossessed them. The opposite is true in the Palestinian situation. BDS does not seek a two state solution for two peoples, but rather the dissolution of the only Jewish state. The movement does not advance reconciliation or peace and in fact sets peace back by hardening Palestinian positions creating a sense that Israel is somehow going to be pressured to give in and agree to its own redefinition and neutralization, and if possible, complete removal. This is not going to happen! Babbin says that “the purpose of the BDS movement is to exile Israel to a political ghetto reserved for the world’s worst nations.” However, Israel is singled out precisely because it has not earned its way into the small club populated by China, Cuba, Syria, Iran and North Korea which somehow get a pass in the U.N. on their human rights abuses, in some cases with their representatives serving on the Human Rights Commission of the UN. Yet, no matter what Israel does, no matter than they call the cellphones of people whose property they are going to bomb, and drop tens of thousands of warning leaflets on areas they will be shelling later, and even though they have precise military instruments that target areas from which rockets have been fired at them, and even though they pull back from shelling areas where they see civilians amassed, etc., somehow, Israel is the Great Satan in the area. This is so because of residual cultural anti-Semitism, because of ancient animosities, and as we will see, because such positioning serves the purposes of certain geo-political alignments. 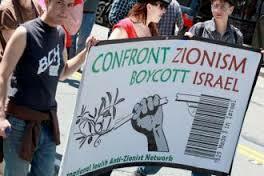 BDS is the Third Intifada. Although its roots go back further, the explicit idea of the BDS Movement began in a 2001 meeting in Tehran in preparation for the World Conference Against Racism, Racial Discrimination, Xenophobia and Related Intolerance later that year in Durban, South Africa. In these meetings, representatives of Arab nations, Iran and others that were obsessed with the narrative that they themselves had been colonized in the 19th and early 20th centuries plotted to advance their grievances against the West, especially against the USA and Israel, which they viewed to be the last strongholds of oppressive colonialism. Fundamental Jewish religious law provides for massacres and genocide of non-Jewish civilians including children. As’ad Abu Khalil, a professor at Cal State Stanislaus and briefly a visiting professor at UC Berkeley, is one spokesman for the movement who does not hide its real intent. He says, “the real aim of BDS is to bring down the state of Israel…Justice and freedom for the Palestinians are incompatible with the existence of the state of Israel”. The ideological and intellectual roots of the BDS movement are found first in the Arab League’s boycott that has been maintained since 1948, and institutionalizes tertiary separation–boycotting Israeli goods, boycotting those who trade with Israel, and boycotting those who associate with those who boycott Israel–and also the Soviet Union’s efforts to isolate Israel and condemn Zionism. The idea of having Zionism condemned by the United Nations originated with the Soviet Union in the mid-1960s, before the Six Day War, stemming from the Soviet refusal to have anti-Semitism condemned by the UN. Since the Soviet Union could not openly voice its advocacy of anti-Semitism, it conditioned its acceptance of condemning anti-Semitism on a demand that the U.N. condemn Zionism and Nazism. This occurred in 1964 and 1965. Since the 1967 Six Day War inflicted a severe blow on their weaponry and prestige, the Soviet Union developed militant policy to regain and enlarge its influence in the Middle East. The backbone of this policy was a their near total backing of the Palestine Liberation Organization. They supposed that such an alliance would bring the “Arab street” and the Arab states to the Soviet Union’s side, and this turned out to be the case, especially in Syria and Egypt. But working through its surrogates, the Soviets were still out to disempower Israel and its patron the United States of America. On 22 November 1974, the PLO obtained UN observer status as a national liberation movement. In August 1975, the Organization of African Unity explicitly referred to depriving Israel of “its status as member.” At the General Assembly on 1 October 1975, Ugandan dictator Idi Amin called upon the people of the United States of America…to rid their society from the Zionists in order that the true citizens of this nation may control their own destiny and exploit the natural resources of their country to their own benefit. I call for the expulsion of Israel from the United Nations and the extinction of Israel as a state so that the territorial integrity of Palestine may be ensured and upheld. In July 1975, the Soviet Union and the PLO succeeded to have Zionism explicitly condemned at the UN International Women’s Year conference in Mexico City, which stressed in its final declaration that “Peace requires the elimination of colonialism, neocolonialism, foreign occupation, Zionism, apartheid and racial discrimination in all its forms.